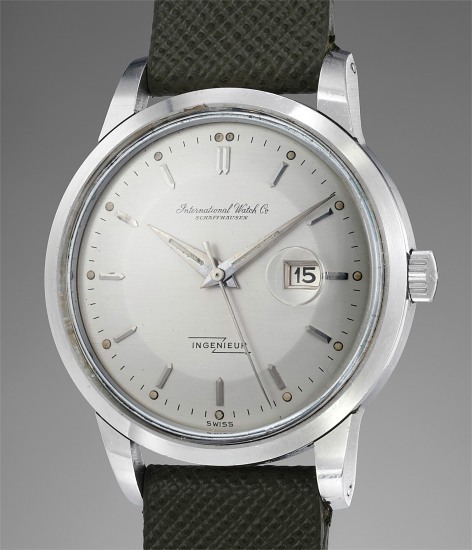 According to the archives of IWC, the present watch was sold to Tokyo wholesaler Shiro on August 18, 1959. The term “New Old Stock” (NOS) may have been abused, in recent times, to describe wristwatches in very good condition. It should however be reserved to those pieces which are indeed in “as new” condition being part of an old unsold stock, or watches bought and never used. In fact, the present timepiece is one of those rare examples which fully deserves, without exaggeration, the NOS qualification. Offered in absolutely unworn condition, it can be used as a scholarly example of how an Ingenieur looked like when purchased from a retailer in the late 1950s. The presence of its original box and Guarantee - rigorously undated, as expected from an unsold timepiece - represents the final touch which propels this specimen into pure horological perfection: simply put, it is impossible to find a better example than this one, and furthermore it would be unimaginably difficult to find another one in a condition even approaching that of the present piece: the very definition of “unmissable opportunity” for collectors of vintage watches at any level. With a clear focus on technology and development, the Swiss watch manufacturer IWC Schaffhausen has been producing timepieces of lasting value since 1868. The company has gained an international reputation based on a passion for innovative solutions and technical ingenuity. One of the world's leading brands in the luxury watch segment, IWC crafts masterpieces of haute horlogerie at their finest, combining high precision with masculine design. Vintage wristwatches such as the oversized Portugieser, Aquatimer, Ingenieur and the B-UHR pilots watch are especially desirable for collectors.